Gareth Porter isn’t fooled by the American ‘ganda machine. While we were out — thanks to our Dell laptop meltdown — he rang in the New Year for the Inter-Press News Service Agency with an analytical piece headlined, “US Military Still Runs With Dreaded Wolf Brigade,” just as the Bullshitter-in-Chief‘s regime started rolling out word about plans to rein in the Iraqi death squads. Despite the U.S. command’s announcement last week that it would seek to curb abuses by Iraqi commando units, the U.S. military has been extremely tolerant of the most abusive unit of all — the notorious Wolf Brigade — because it regards it as highly effective against the insurgents. In light of the U.S. command’s past close relationship with the Wolf Brigade and its attitude toward its abuses, the latest move by Washington to distance itself from commando operations such as the Wolf Brigade appears to be more of a public relations ploy than a substantive change in its own policy toward commando abuses. Which is just what we’d been saying all along. In fact, the day his piece appeared on Jan. 2, Porter messaged us: “Great post on the US uses of Iraqi torturers and death squads.” He was referring to our item of Dec. 20, HIDDEN IN PLAIN SIGHT. Porter’s IPS analysis was the perfect riposte to PBS’s News Hour With Jim Lehrer, which had an astonishing segment on Dec. 30, TRAINING IRAQI POLICE FORCES, featuring several government officials who were trotted out to express the U.S. regime’s sudden concern about the death squads. One of the officials was Steven Casteel, right, identified as the senior U.S. advisor to Iraq’s Ministry of Interior (which ran the Wolf Brigade) from October 2003 to July 2005. He was one of the key Americans who helped to oversee the training and creation of Iraqi police forces. The Newshour made no mention whatsoever that Casteel had been singled out in The New York Times Magazine and other news publications, along with another specially assigned U.S. military advisor (James Steele), for his dark history of collaborating with paramilitary death squads in Latin America. This made Casteel’s expressions of concern for the rule of law and the Salvadorization of Iraq impossible to believe. Yet there he was, one of the chief architects of the Iraqi death squads, smooth-talking the issue of reining them in as segment host Jeffrey Brown lobbed him softball questions. 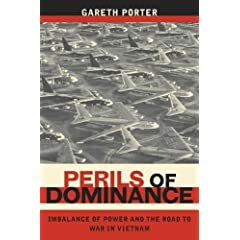 Porter argues that “high-ranking national security officials” who believed in U.S. superiority were “the main impetus for military intervention in Vietnam.” You don’t have to be a genius to draw parallels with the invasion of Iraq.